When setting prices for your games, you should be careful to make sure that you're setting them in the right currency. ...with a price tag of $800. Oh, huh. Talk about your premium pricing, wow. The developers must either think they have a really, really good game, or they're shooting for the "We'll make a profit by selling our game to the 20 people dumb enough to buy it for four-fifths of a grand" business model. Which there may be some validity to, of course. In all seriousness, this is certainly just an error on Microsoft's part - someone meant to type in "800 MS Points" (or $10) and ended up pricing the game at 80 times that. 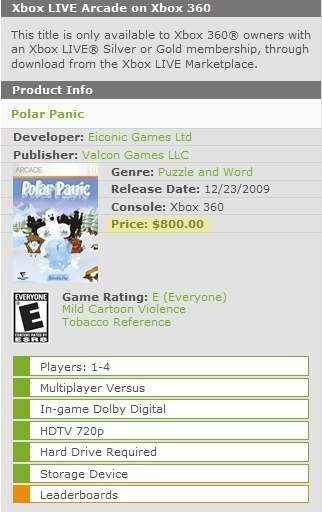 Let's hope it gets corrected by the time the game comes out, or the poor Polar Panic folks might find their game not selling as well as they'd hoped.